Hello again! Last time around, there was mention of wanting to do more frequent blog posts leading up to the release of First Snow so here’s our monthly(-ish) wrap-up, with another hopefully coming near the end of March. So, first off are the updates on our FS progress: The initial directing pass of Act 1 has been completed. 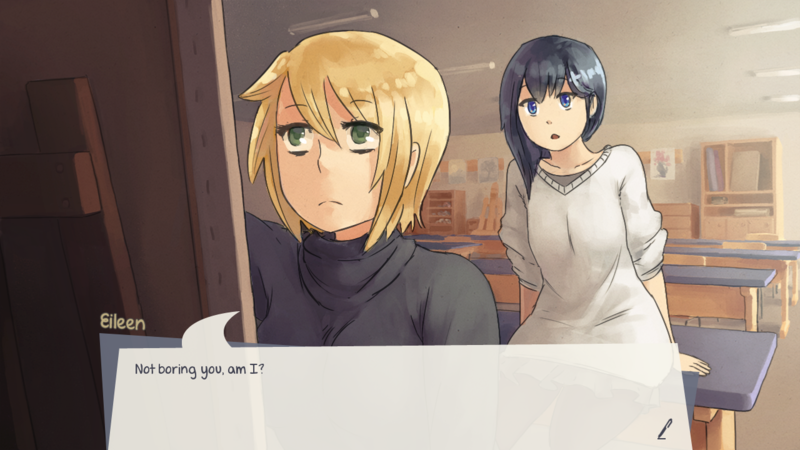 There are some placeholders being used and some general jank to iron out, but you can read the first third of the VN with some sort of audio+visual backdrop all the way through. We’re a few scenes into Act 2 at the time of writing. On the art side of things, we mentioned last time that we wanted a few more poses for Eileen given her prominent screen time in FS, so work has begun there as well. A large handful of CGs have had their lineart finalized, with even more (~2-3) planned to be ready before the end of February. BG production has ramped up as well, with an average of 1 being done a week at our current pace. Keep in mind that we currently only intend to do this in outdoors winter areas or cases where specific indoor bgs warrant it; we’ll be using our traditional color scheme otherwise, due to their relatively neutral lighting. Okay, now for the big one: due to Mehkanik’s hectic schedule, he’s had to step down from writing Twofold. While this is obviously giant and scary and grim-sounding all around, we managed to establish a plan pretty quickly. Mehkanik will still be helping edit the TF scripts, but All-Maker will now be writing the actual VN. We didn’t want to rely on outside help for this, as we love our core story but didn’t think it would be fair to ask around for help and then ask that they stick to our story. Thankfully, All-Maker felt the same and offered to step up and work on the writing. An obvious problem in regards to this idea is that he’d be juggling CG duties as well as writing an entire VN, so we’ve established a system where our other artists (Skrats, Twr, Curchack) will be drawing up the base of the CGs, with All-Maker doing the final lining to maintain consistency. So far this has gone great, with CGs going at the same, if not better, pace as before. As for writing progress, All-Maker has established where he wants to take things and how he plans on doing that, so making some proper outlines is next on the to-do. We’re prioritizing getting the FS CGs out of the way ASAP so All-Maker can fully focus on writing after the fact. Looking forward to First Snow. That colour temp thing is super neat, good job guys! Also RIP Mehkanik (he never scored) and good luck to All-Maker! Always glad to get an update I already can't wait to hear more.